when i was a kid, i joined cub scouts because i was given a flyer in class and it depicted camping and i wanted to go camping. we never went camping. however, we did other boy scout things, like learning how to use a compass and something about ironing patches. we also did the pinewood derby thing, which is a race for little cars made out of blocks of wood. i recruited my dad to help me with my design. my dad is great at working on real cars, but a carpenter he is not. he badly screwed up the block of wood, not shaving the front right or something so it looked like someone had hacked at a fencepost and he grew frustrated with a lot of swearing. we went back to the hobby store to buy another derby kit. the day of the race came and i placed my derby car at the top of the track. all the other kids had red and blue cars that looked like something from your typical formula 1 race. the heat began. they pulled back the boards, letting the cars fly. in a few seconds it was over, except my car had barely moved. it squeaked very slowly to the end. i was in last, last, last place and was quickly eliminated from the first bracket. 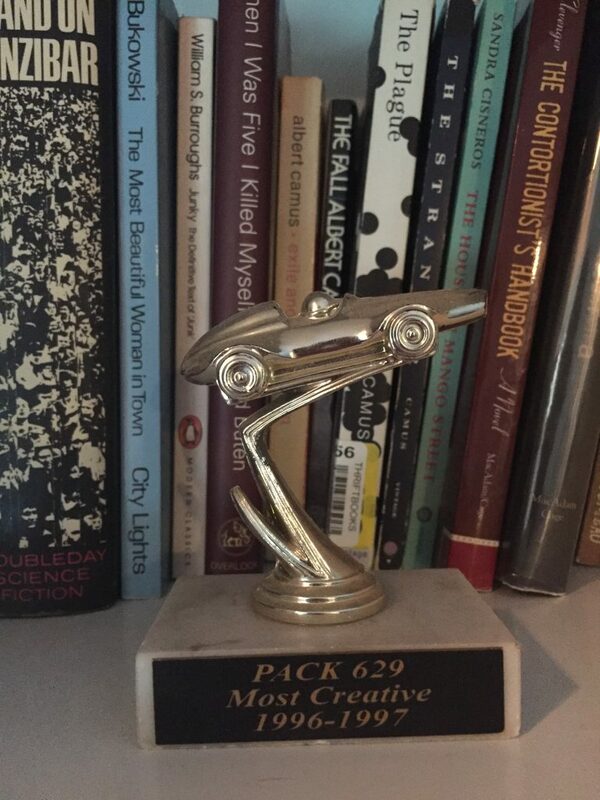 however, i did get a trophy anyway—for ‘most creative.’ (pictured) and naturally, i valued that distinction a lot more. you could interpret it as some sort of lesson—you don’t have to win, you just have to stand out—which, seems to be a fairly consistent philosophy in my life. but i also don’t want to be heavy-handed with some sort of moral or whatever, either. it’s just a nice memory i have.